According to reports made to the ICC Commercial Crime Services as set out here, things are relatively calm on the piracy front. 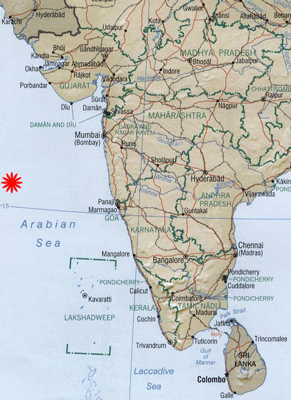 The report includes reports 3 attempted boardings by robbers of ships at anchor in ports in Indonesia, Brazil and India and one unsuccessful attempt to board a bulk carrier in the Arabian Sea at 15:24.82N - 066:21.62E. I have roughly plotted this postion on the map at the red burst.